(Birmingham, Alabama) - Located in the foot-hills of the Appalachian Mountains, Birmingham, Alabama is home to over 240,000 residents with a metropolitan area population of over 1,000,000. The city hosts a growing population in the healthcare, banking, industrial, service, and engineering businesses. Birmingham’s skyline is also scattered with hotels, theaters, businesses, high tech hospitals, research and educational institutions. In addition, a great history gives the city character. 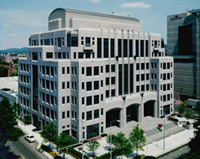 Energen’s headquarters is among the leading businesses contributing to the economy of Birmingham. Gas and oil production and exploration are the mainstays of Energen’s business. In addition to monitoring these assets, the headquarters oversees the productivity of two other divisions: Alabama Gas Company (Alagasco) and Energen Resources. Alagasco is located within the headquarters and distributes gas to approximately 463,000 homes throughout Alabama. Energen Resources, on the other hand, controls the reserve locations that dot the western United States. To modify the chiller, the company added KMC controls to manage frequency drives that control fan speeds and allow the condenser water temperature to remain in the specified range. Also included in the modification, KMC products have enabled the chiller to sustain a minimum water flow through the condenser with a bypass valve until the desired water temperature is reached and then it modulates to maintain a set point. The outcome of the project proved to be a success. “The company”, as Frith stated, “has been able to save $4300 per month based upon being able to utilize the previously unused gas absorption chiller.” This saving has not come at the cost of discomfort to the employees of the facility. In fact, due to the change, overall comfort levels have been enhanced dramatically. Alagasco, through the use of KMC products, has monitored the trends of the newly corrected gas absorption chiller. The trends are viewed through the company’s installation of WinControl® software on the facility’s computers. In addition to the trends, the digital controls through WinControl also alarm the proper personnel at Alagasco when there is an alert. Alagasco also had an ongoing problem with its rooftop desiccant units that collect the outside air to distribute throughout the building. The air passes through a filter, as well as gas water heaters and coils to remove much of the latent cooling load. The units were not working properly with the controls that were originally installed. So, with the help of CCSI, the desiccant units were reprogrammed and supplied with KMC controllers and now are working properly.